Thank you so much for the yodelling Marmot!! We all love him!! That was so sweet of you. We have 2-week old puppies and they were all making noises, which they do whenever they are awake but not nursing, so I pressed the Marmot's foot to see if the yodelling would quiet them down, and it did! So Cherry took him off the table (he was still in the box) and brought him into the whelping box and placed him in with the puppies! I rescued him right away so he wouldn't get peed on, and had to put him high on a shelf, because Cherry was convinced he was one of hers! It was too precious. We wish you all the very best for the Holiday Season. 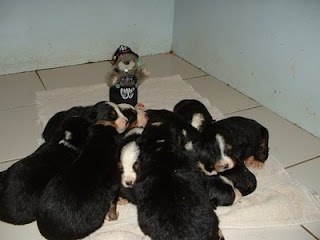 So Cherry's puppies were only a few weeks old in those photos, however below is what the pups will resemble at about 6-8 weeks old. 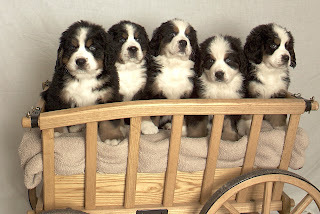 All puppies are cute, however no doubt that Bernese Pups are the extra-special of the extra-cute categorie! Bernese Mountain Dog Club of America!